As we are in the middle of the summer this is the most likely time you will start to suffer from various allergies. This may not be because of only the gorgeous weather but sometimes if your air conditioning system has not been properly maintained this could also trigger a seasonal allergy. 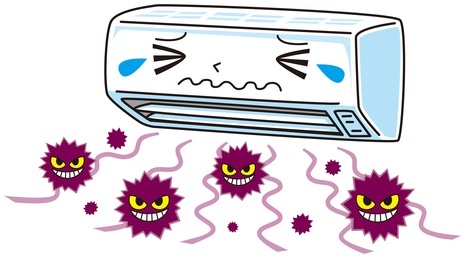 In this article we will discuss how air conditioning systems trigger allergies and how you can possibly prevent this from happening to you. One of the most common reasons for your air conditioning system triggering of your allergy is because of your filter gathering dust. The filter is an important part of the air conditioning unit and needs to be properly maintained and failure to do this will result in it gathering dust which can seriously impact on your health. It is important to understand that the dust will not only gather whilst your air conditioning system is on but also whilst it is off as well. From dust mites to pet dander once this enters the filter then you can expect to catch an allergy. Overall dust is referred to as a general term as various things can get caught up within the filter which could do you harm. You will typically find that you may suffer from itchy eyes, may continually sneeze or even worse suffer from severe headaches. In order to guard against this you must ensure that you regularly clean the filter by either hoovering it or by removing any debris via a brush. It is recommended that you clean your filter at least every 20 to 60 days which not only helps in ensuring your air conditioning runs smoothly but it will also keep you away from the allergies as well. Unfortunately air conditioning mold can spread around your home as soon as you turn the unit on. This is mainly associated with old air conditioning units especially as they have been in operation for a long time and as a result they are more prone to attracting mold. This could lead to numerous health problems which do not tend to be pleasant. All types of mould can lead to many different health problems which include headaches, high temperatures and even a spell of dizziness. The worrying thing is that sometimes mold can produce toxic compounds which can lead to serious health problems especially for people who suffer from asthma. You may feel that you are ok but all of a sudden these type of symptoms may start. If mold is left untreated for a certain length of time then it is very hard to remove. As soon as you notice any type of mold appearing in or around your air conditioning unit you must ensure that your air conditioning unit is cleaned as soon as possible to prevent any further problems. To prevent any mold from appearing in the first place you can seek professional guidance from specialist staff who will clean your unit thoroughly and from a personal point of view again cleaning it via a brush can do the trick. Improving the overall air quality within your home is essential when it comes to preventing allergies. This can be done in various ways. Firstly you should vacuum your home at least every other day if you cannot do it everyday as this will ensure that your home is nice and clean whilst also ensuring that any dust is removed from your carpet or sofas. If you have a pet in your home then it is recommended that you keep them outdoors as sometimes air conditioning is not an animal’s best friend due to the temperatures they create within your home. By improving the overall air quality you will decrease the chances of catching any allergies which will ensure that you can enjoy the rest of your summer.